Former favourite Ali Al Habsi is standing in the way of Wigan Athletic’s survival hopes at Reading on Saturday. And Graham Barrow, whose men simply have to win to have any chance of staying up, admits it’s another huge barrier that has to be overcome. “It’s not ideal, because everyone at this club knows what Ali’s capable of,” acknowledged Barrow. “He’s always seem to be capable of that little bit of inspiration in the way of making great saves. Al Habsi, who spent five seasons with Latics between 2010-15 before leaving for the Madejski Stadium, is regarded as one of the best goalkeepers in the Championship. And Barrow insists the Oman No.1 fully deserves to be rated so highly, thanks partly to his grounding at the DW. 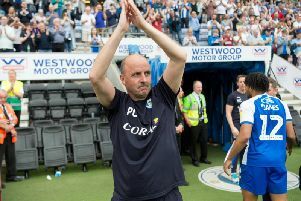 “You’d have to put him up there, because of the experience he’s got,” revealed the Latics interim boss. “He doesn’t look a day older than when he walked into this club, but the experience and know-how he has picked up – especially here – is second to none. “You wouldn’t have wanted to be anywhere else over the last 10 years, it’s been fantastic. And he was a very big part of that. “I still remember his debut, at Spurs (in 2010), who’d beaten us 9-1 the year before, and to beat them was amazing. “He made some fantastic saves that day, and he kept that level up for the whole season. “He’s a top professional, and one of the nicest people you can ever meet in football. As well as Latics, it’s also a big game for the Royals, who require a positive result to rubber-stamp their own play-off finish. And it’s a top-six position Barrow feels they deserve, with boss Jaap Stam taking a leaf out of the copybook of a certain Roberto Martinez. “They play in a way that’s almost reminiscent of when Roberto was here,” recognised Barrow. “He stuck to his guns, he stuck to how he wants to play the game, and they are the best at it really. “It will take a huge effort to get anything out of the game. Barrow is also adamant his players will not be stifled by the occasion, with so much riding on the result. “I thought last weekend (against Cardiff) we actually played as freely as we have done for a long time – throwing people forward and attacking their goal,” he added. “We’re going to have to do that again, but also with a little bit of caution. It can’t be a repeat of the Reading game here, which was virtually over after four minutes. “They do have that ability, but they do take chances – and we need to capitalise on that. “Under Roberto, we’d always go out with the attitude: ‘Let’s go out and win it’.